If you weren’t sure what to give to a future king, who probably has everything – there is some relief: Prince William and Kate Middleton have set up the Prince William and Miss Catherine Middleton Charitable Gift Fund, asking well-wishers to donate money instead of gifts. The money will then go to a number of causes that the couple has carefully chosen. Most of them were not well known so far, but the couple thinks they deserve more attention. Prince William and Miss Catherine Middleton have created a charitable gift fund to help celebrate their wedding. The fund will focus on assisting charities which support the five causes chosen by the couple. These causes are close to their hearts and reflect the experiences, passions and values of their lives so far. Having been touched by the goodwill shown to them since their engagement, they have asked that anyone wishing to send them a wedding gift consider doing so in the form of a donation to the fund. 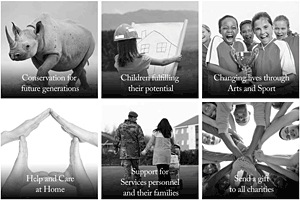 The money will then go to 26 charities that fall into the categories of Changing Lives through Arts and Sport, Children Fulfilling Their Potential, Help and Care at Home, Support for Service Personnel and Their Families, and Conservation for Future Generations. Donors can give directly through the Website and select, which of the causes they want to support, or simply give to all of them. While most of the charities are of course located in Great Britain, some are based in Canada, Australia and New Zealand. The U.S.-based PeacePlayers International’s program is also on the list, it was founded ten years ago by Washington residents Brendan and Sean Touhey and aims to get kids together in conflict-torn areas of Northern Ireland through basketball. This was written by admin. Posted on Saturday, March 19, 2011, at 4:01 am. Filed under Wedding. Tagged Charity, Donation, Wedding Gifts. Bookmark the permalink. Follow comments here with the RSS feed. Both comments and trackbacks are currently closed.